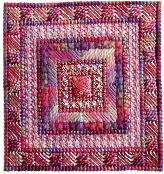 I would like to share how the choice of needlepoint fibers used can change a design completely! 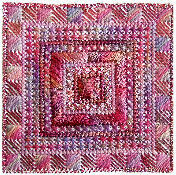 At my workshops I provided my students with many different types of threads and let them choose which to use. Although tentative at first, before long they were dipping into the pile on the table and picking the one that would give them the effect they were wanting, for each section of my designs. At the end of the class they all clamored for follow on lessons so they could have more fun! 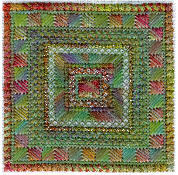 Let's look at a single design and how the needlepoint fibers used for each one give such a different result. We will take a look at my design, Infinity, for this first comparison. The students were provided with hanks of Oliver Twists "One Offs" which contained a selection of cottons, rayons, linens and wools, all space-dyed in the same dye bath so that the colors blend together. 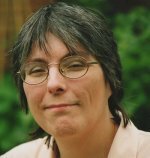 Anne (above) used shiny rayon threads for some areas to give a luxurious look to her work. 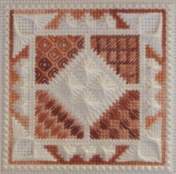 She alternated the rayon with cotton fibers for the border of Scotch stitch. Although not entirely apparent in this photo, in real life the results of her thread choices were stunning. Alison, on the other hand, picked a chunky thread for the wider cross stitch rows and a more delicate cotton for the paler smyrna stitches. This has emphasized a different part of the design. I see a frame within a frame effect going on here. By changing the color scheme as well as the threads used, we get an entirely different appearance. Margaret chose green and autumnal colors for her work. She has emphasized some of the borders with a metallic thread, which contrasts nicely with the matt fibers used elsewhere. The palest colored border is worked in a fine cotton, changing the density of that area to make the center area stand out. One of the highlights of the Textures to Dye for classes is when previous students bring in the work they did in an earlier workshop to compare with each other. Even though they know they used the same pattern, their unique use of color and texture result in joy and excitement during this show and tell session. The differences are clearly illustrated by the following pieces, all worked from my Tranquility design. Color as well as fiber is used here to good effect. 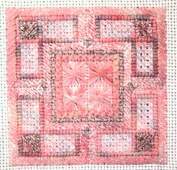 The shiny pink thread used for the slanted gobelin stitch makes that section stand out against the darker center. The darker, matt outside border (also slanted gobelin) frames the work wonderfully. Doesn't the version above look different? The finished piece looks more like a traditional knot garden with flower beds in each corner, surrounded by pink brick pathways. 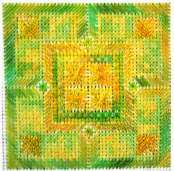 The thin thread and paler tones make the rectangular areas stand out and the darker outlines bring them into focus. 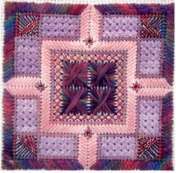 The variegated pink tones used for the rhodes stitches in the center resemble multi colored flowers. Jean chose a different "palette" completely! The shiny golden tones contrasted with matt greens remind me of sheaves of wheat standing in a field surrounded by green hedges. 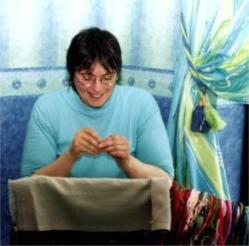 The following two examples were not stitched at one of my workshops. In fact, the left hand piece is my own work whereas the right hand sample was stitched by a customer at home. 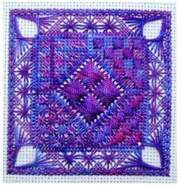 I picked my favorite color, purple, and a hank of Oliver Twists' One Offs, whereas Erica chose a more monochromatic color scheme with a plain thread contrasting with a multi-colored one. My version tends to show off the shiny thread used for the rhodes diamonds in the centre, while Erica's careful choice of color and the needlepoint fibres, has highlighted the four different stitches used in the triangular areas. I hope these examples have helped to show that your creativity and the choices you make can lift your work out of the ordinary and make it unique!